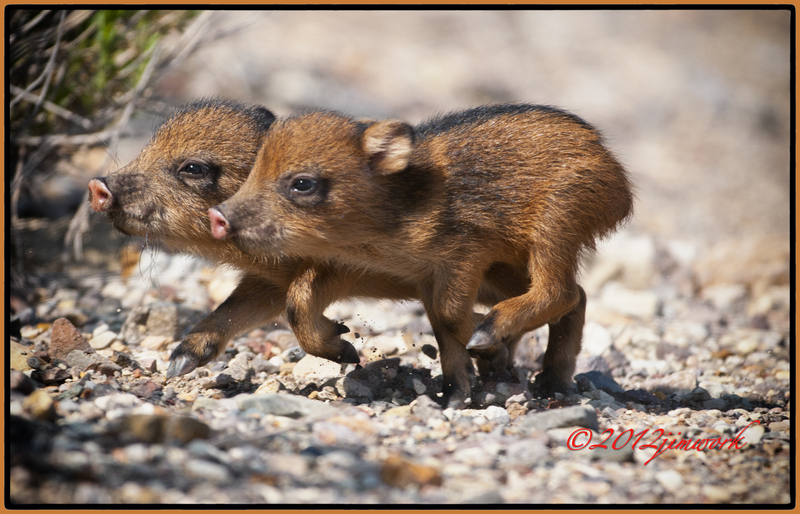 LITTLE PIGLETS ON THE HOOF!!! We had a great visit to Big Bend National Park. God give us an incredible amount of presents to view. We are new to trailer camping and for the most part, it is a nice comfortable way for us that have grown too brittle to sleep on the ground. All that being said, we stayed at Rio Grande Village campground and I am sorry to say, (& I do like kiddos) were surrounded by little rug rats that had never been taught the courtesy of camp etiquette. They were constantly very loudly cutting through our camp, usually jumping up to look in our trailer. I didn’t think I wanted to be around anymore kids (granddaughter L.J. excluded) for a long time. Imagine our surprise at showing up at Dugout Wells and having a herd of 25-30 Javelina (collared peccary) cross our path. At the end of the procession were these two young-ins that were all of 8 inches in length. They were pedaling their little hoofs as fast as they could to stay up with those longer legged adults. I got to tell you they were cute and it was us who were invading their space in the desert. They are adorable! The pigs… not the annoying rugrats. Wow, lucky you to be in the right spot and just the right time to capture such an exclusive shot. Great human interest post! Would love to hear and see more about your camping experiences. We own an RV but only get to use it a few times a year; not able to retire just yet. A friend posted this link…I LOVE THIS PHOTO!! I’m an alumnus of Texas A&I University in Kingsville (now TAMUK). The javelina is our mascot, and the only university with such a mascot. I hope you don’t mind but I shared this with our alumni association. I’d love to buy a print, either 5×7 or 8×10. Such a beautiful picture…thanks so much for sharing it! !